Evil Pumpkin: The Lost Halloween is rated 3.9 out of 5 by 54. Rated 5 out of 5 by Pink2112 from Tough but fun! Great game! Too bad there isn't a CE version. Rated 5 out of 5 by terraNoxArcana from The Evil Pumpkin Delivers!! You are a young boy who has learned about a holiday called Halloween, it's not celebrated where you live, your Dad is hiding things from you and you are now trying to figure out why.... I HAVE NOT GIVEN A GAME A 5 STAR REVIEW in over 4 YEARS. I am a tough one when giving out stars..so this is very rare for me. The games nowadays are mind numbing, predictable and boring. I was so pleased and frankly surprised to stumble upon this little gem earlier this week. This game is going to make you think and use your mind. If you are looking for something easy, that hands you everything and moves real fast, this game is not for you. If you want a challenge, want to work, this game is what you are looking for. I have been playing all my games on hard mode for years now and they are just not in any sense of the word hard. I played this on hard mode and it took me 4 days to finish. The games I usually play nowadays I am lucky to get 4 hours out of. This is a long game in hard mode!! It reminds me of the games I played 6 or so years ago on here. The good ones. You will collect pieces of candy throughout the game and use it to buy decorations for your backyard. My main problem with this game is the bad translations into English. Some may have been puns but others were obvious mistakes. Be aware I did have to go to a walkthrough to solve one puzzle (hangs head) I just could not figure it out and had spent a good hour trying to solve it. When I did finally get the solution I was really bummed out as there was no way I would have gotten the answer with the written clues given. I was halfway there but the second half to the puzzle made no sense. Maybe it was a bad translation that was vital to solving it. Also, the game ends abruptly. There is no final scene to "wrap things up", it just ends. But let me tell you these are my only complaints. The game will challenge your grey cells, has lovely music and WONDERFUL artwork, with a fresh and fun story line. After years of trying to find a good game for me, this little gem pops up. I hope I will find more games like this in the future. Hope you will enjoy it as much as I did. Remember I played in hard mode, I have no idea of how easy regular mode may be/what clues are given. Give the demo a try. Rated 5 out of 5 by JJ_High from Yes, please! Outstanding. Love challenging games. Best part of all no HO scenes, yay! It's an actual game using logic and deduction not an overrated eye exam. 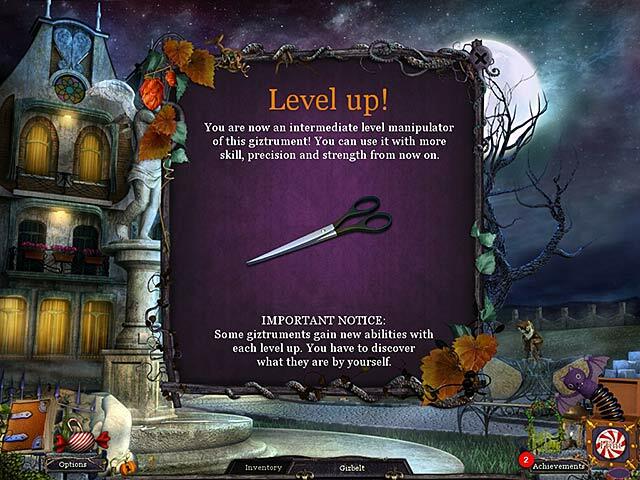 Rated 5 out of 5 by JulzCat from Best Halloween Game Ever!!! 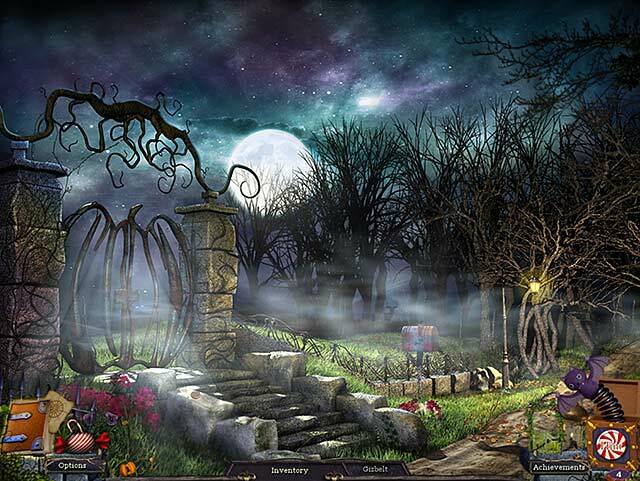 If you liked the movie "Twas The Nightmare Before Christmas", you will definitely be into this game. It was a toughie, so you might want to play in beginner's mode even if you normally don't (there will be no HO scenes unless you do beginners anyway). It felt more like a large file game then it did a HOG. There are points where you will get stuck and hints won't be provided, so you'll have to peek now and again at the Big Fish forums or YouTube videos (especially for the ending). My absolute FAVORITE part was collecting all the candy to buy decorations for my backyard for Halloween. This game really got me in the mood for costumes and trick-or-treating! Rated 5 out of 5 by gallica2 from WOW. JUST WOW! this is one of the best SEgames in quite a while. and i never would have caught it, except it was a 'daily deal'. great graphics and yes, you will need glasses :). great puzzles and 'inserted' conundrums within the story. yes, there are a few HOs, but not so many as to make gameplay tedious. humour. i didn't want it to end. thank you devs. at last a game for the leetel grey cells. Rated 5 out of 5 by dollyflower from Fabulous Game This is definitely a 5 star game. I hated the slow hint refill at first, but then came to appreciate it because it caused me to experiment around for solutions. So many of the found objects are used in ways that are out of the ordinary. The artwork is gorgeous and the music unique. I actually bought the game last year and hadn't finished it by the time Thanksgiving rolled around, so I saved it for this year. What a treat this game has been. Prepare for a challenge. Rated 5 out of 5 by beckykay from Best of 2014 so far I loved this game. A huge thank you to the developers for giving us a delightful several hours of fun! This is my favorite game of 2014 so far, and the year is coming to an end. It is just the right amount of challenge with a bit of humor thrown in for good measure. The storyline is intriguing and smart. I love that I had to actually think about things while playing this game. The graphics are clear and well-done and the puzzles are refreshing and fun. The only improvement I would make is to the amount of time for hint refill - it is way way way too long. I had to end up using it quite a lot and so that's why I say - shorten that time. It was a rather big frustration for me, but I still loved the game. I didn't want it to end, because it's so rare that we're offered a game of this caliber. Amazing game, really. This is how it's done. Please give us more like this BFG! 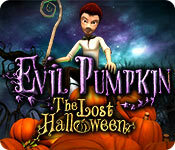 Rated 5 out of 5 by rundll from evil pumkin lost halloween This game is really very good. Makes you use your brain. Kept my interest all the way through. Did'nt want it to end. Although it is quite a long game. A hidden gem. please more of the same. Rated 5 out of 5 by chinadoll012 from Challenging The game is extremely challenging, which can get frustrating at times but well worth the effort when you finally over come the current obstacle. If you're the type that prefers more casual, play leisurely without much thought, then skip this game. Although I would definitely recommend for everyone to try the demo at least. 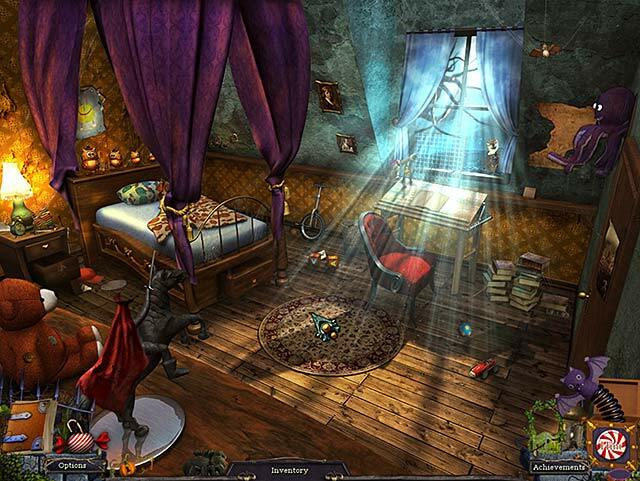 Seek the help of Lemuel Barnabas and unravel the mystery of what happened to Halloween in this ludicrous and imaginative hidden object adventure.